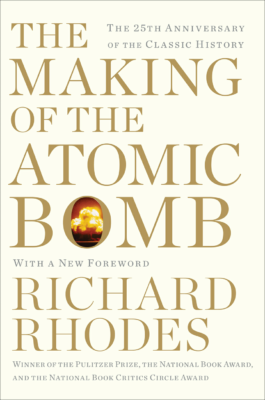 Richard Rhodes’ Pulitzer Prize-winning The Making of the Atomic Bomb has been on my to-read list for a long time. After reading this exquisitely detailed history, I believe the development of the atomic bomb in the Manhattan Project was the pivotal event of the 20th century. The bomb was, simultaneously, a tremendous culmination of a half-century of scientific achievement, a deplorable instrument of war that indiscriminately killed hundreds of thousands, a shortcut to end a war that saved millions of lives, a threat that instigated the Cold War, and perhaps even a marker in geologic history. The first half of the book dives deeply into the scientific work of physicists, chemists, and engineers from the 1911 discovery of the atomic nucleus through the 1938 discovery of nuclear fission. The story follows Niels Bohr, Leo Szilard, Robert Oppenheimer, Ernest Rutherford, Enrico Fermi, and dozens of other researchers in biographic detail across these decades. The importance of international collaboration is repeatedly emphasized: such rapid scientific progress would have been impossible without timely publication of results for replication and further study. In many cases, multiple laboratories made key discoveries (e.g. the existence of the neutron) within days or weeks of one another, racing be the first to mail their revelations to journals. Anchored by Niels Bohr, this close-knit community shepherded Jewish scientists to safety as anti-Semitism arose in 1930s Germany, many of whom would later work in the Manhattan Project.